When I started running a few years ago, I didn’t read up on it or look into proper techniques. I mean, it’s just running, right? How much could really be involved? Turns out I was super wrong. While running short distances is no problem, when you get into longer runs, bad habits will really come back to bite you. I’m currently recovering from an IT Band strain and can’t run more than a few miles, as an example. I thought I’d share a few of the good habits I’ve started, so hopefully you can avoid the same mistakes I made. 1. Drink Water. I know this sounds simple, but up until a year ago, I used very little water on my runs. I didn’t even own a hand carried water bottle when I trained for my first half marathon. Granted I still don’t use one on short runs, but anything 8 miles or more? You bet I’m grabbing my water bottle (or belt!). 2. Use energy gel. Whether it’s in goo or chew form, use them. I thought it sounded ridiculous at first, but it made a huge difference. I don’t feel like I want to die when I finish a long run anymore, which is pretty great. Plus they give you that nice boost at the end to keep pushing for those last few miles. 3. Stretch! This is what led to my current injury. 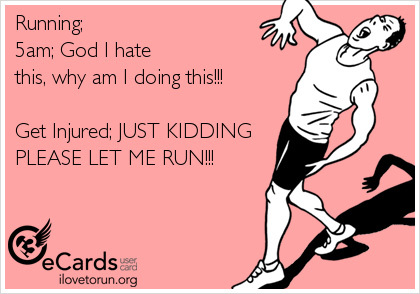 I never stretched or foam rolled my legs after a run, and apparently when you’re training for a marathon and running 15 miles or more every other weekend, this is really a bad idea. I’ve started foam rolling ever since, and it makes my legs feel a thousand times better. It literally takes 5 minutes, and should be done after any long run. 4. Find a training program. When I ran my first half marathon, I just winged it and ran whatever I felt like on my training runs. It wasn’t the end of the world and I did finish it, but once again, it could have been a whole lot easier. I discovered this during my second half marathon in which I used one. There are a whole bunch of training programs out there, so take your pick! I use (and enjoy!) the ones by Hal Higdon. There you have it. Four simple things that will make your running life a lot better. If I could go back in time, I’d start doing these things from the beginning so I could avoid the current injury I’m dealing with. Thanks to Emily for encouraging me to make these changes!